DM (CDRM) In The German Shepherd. The BEST! 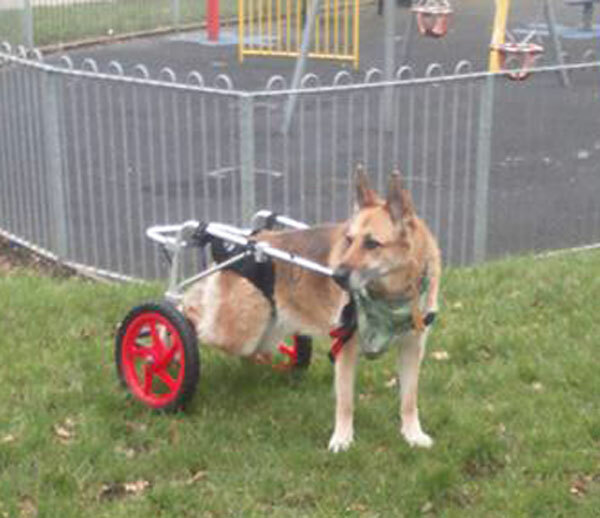 Information & Advice ONLINE that YOU need to KNOW on Canine Degenerative Myelopathy. Previously called CDRM (chronic degenerative radiculomyelopathy) is now more often referred to as Canine Degenerative Myelopathy (DM) which causes the death of the nerve cells carrying messages to and from the limbs. It is a progressive disease which leads to paralysis of the hind limbs in middle-aged or older dogs. It is non-painful. Mention DM to anyone who has ever owned a German Shepherd and they will all know immediately what you are referring to. DM is a terrible, progressive condition which will ultimately lead to the euthanasia of the dog because it has become paralysed at the back end and can become doubly incontinent, although it's usually the bowels that they lose control of rather than the bladder. The brain remains alerted and the front end remains normal, so watching your poor dog trying to drag itself around on its front limbs is heartbreaking, which makes the decision to put to sleep even harder. Some owners do resort to doggie wheels and many dogs do very well on these, although it takes a great commitment from the owner. A post mortem will show demyelination (loss of the insulating sheath) of the spinal cord, destruction of some large axons (nerve cells leading from the cord to smaller branch nerves), and abnormal cells (or certain cells in abnormal locations). The fact that similar signs may be seen in the brain, kidneys, and intestines, give further hints that the cause of the disease is a failure of the immune system. DM is an immune-mediated, degenerative condition whereby the myelin sheath surrounding the nerves is destroyed. This degeneration occurs in the dorsolateral funiculi in the white matter of the spinal cord, and in the dorsal spinal roots which is why it affects hind limbs first and eventually bowel and bladder functions. Symptoms are similar to those seen in MS sufferers. DM is a disease that predominantly affects German Shepherds although there are now other breeds being affected, particularly the larger breeds and Corgis! German Shepherds have less effective immune systems than most other pedigree dogs and are at greater risk of immune-mediated disorders. They have lower IgA levels making them particularly prone to skin and gut disorders. Anything that further compromises the dog's immune system will exacerbate the problems. We have already published at length the dangers of vaccines and spot on medications for parasites. This condition usually presents in middle-aged or older dogs and is more commonly seen in males than females. 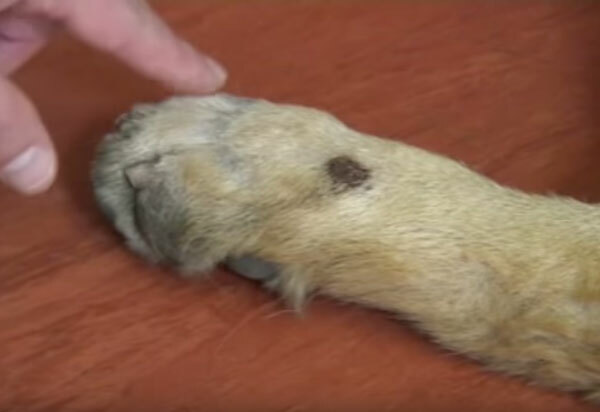 Owners generally notice that their dog is dragging it's back feet, scuffing the top of the nails and as the disease progresses they may develop sores on their feet. The dog loses awareness of where their back end is, they criss-cross their back legs and may trip themselves up. If the dog's foot is placed in a knuckled over position the dog falls or is slow to lift and place it properly. Similarly, if legs are moved away from the body (abducted), or moved inwards towards the body (adducted) the dog does not immediately replace it in correct alignment with the body. Scuffed nails and lesions on hind feet caused by dragging. Diagnosis is not definitive and it's a question of your vet ruling out other diseases that may present in a similar way - such as disc problems, a spinal tumour, HD and Cauda Equina Syndrome (pressure on the spinal cord). Conventional vets will tell you that there is no treatment but I'm sure they won't miss an opportunity to prescribe some toxic medications and insist that you continue with yearly vaccines and other nasties like spot-on medications. All these nasties will, of course, further compromise the immune system - AVOID AT ALL COSTS. Of course, anyone who goes against conventional thinking is labelled a tinfoil hat wearer, a quack or worse, but then the alternative thinkers haven't prostituted themselves to big pharma in the name of profit. Neither do they dish out poisons without a shred of evidence to support their use. For instance, ask your vet to supply you with the clinical trial evidence to support yearly vaccinations - in fact, vaccinations per se. They will become angry or defensive or both because they know there is ZERO evidence. Modern vets are making your pets ill and sending them to an early death. The lengths that Big Pharma will go to protect its interests: Holistic Doctor Death Series: Over 60 Dead In Just Over A Year. I know from many years in rescue, that when a much-loved pet develops DM, their owners are devastated and willing to try anything. An Alternative View On Treatments. An expert in the field of DM is Dr Roger Clemmons from the University of Florida Veterinary School and he has found 2 medications which appear to prevent progression or result in clinical remission of DM in many (up to 80%) of the patients. These are some of the factors that Dr Clemmons has shown that affect the progression of DM. Diet - since it is believed that toxicity, possibly heavy metal toxicity plays a role in DM, then diet is very important. Avoid all processed dog foods especially kibble and prepare home cooked food for your dog - preferably organic. Consider adding tofu as it contains many valuable flavonoids and other ingredients which promote health. Raw garlic is antibacterial and antifungal as well as having an anti-inflammatory and anti-biotic. Add in ginger for it's anti-emetic and calming effect along with mustard which improves digestion and bowel function. It is important to maintain optimal weight if your dog has DM, as being overweight will only add to mobility problems. Exercise - regular aerobic exercise in the prevention of chronic degenerative diseases is important and the two best forms are walking and swimming. 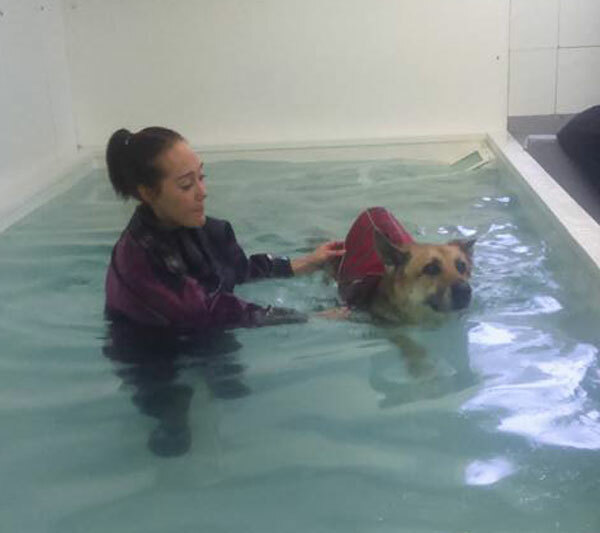 Hydrotherapy is particularly beneficial as it is none weight bearing, doesn't stress the joints and improves muscle tone. Most GSD's love water too. Vitamin B complex - may help in a neural generation. Dogs with DM need the higher dose which should contain 100mg of most of the B components. Nutritional Yeast - Engevita makes one with added B12 which dogs love. Just sprinkle on their food. Vitamin E - antioxidant and slows progression of DM. The dose should be 2000 IU daily. Vitamin C - also antioxidant and works in conjunction with vitamin E and potentiates its antioxidant effect. Selenium - also works in conjunction with vitamin E. Dose should not exceed 200 µg daily. Omega 3 - membrane stabiliser and anti-inflammatory. Ground flax seeds are a rich source. Dr Clemmons suggests a whole list of further supplements in his paper. There is a company in the US that has developed a palatable mix of vitamins, minerals and herbs. It may be worth contacting this company to see if their products could be obtained here - WestLab Pharmacy. Medications - Dr Clemmons has found 2 that appear to prevent progression or result in clinical remission of DM in many (up to 80%) of the patients. These medications are aminocaproic acid (EACA) and n-acetylcysteine (NAC). These can be obtained here but you will need a prescription from your vet. More information here at Spanna. Other supplements that may be useful in DM. MSM - 'MSM is a strong antioxidant, capable of binding and inactivating harmful free radicals. Overproduction of free radicals is caused by physical and mental stress, malnutrition, air pollution, heavy metals and organic contaminants in drinking water and food and radiation.' MSM is also a potent anti-inflammatory for autoimmune reactions, it also crosses the blood brain barrier and allows nerve cells to excrete products. MSM. Does your dog need it? Turmeric - is a great detoxifier and boosts the liver's ability to metabolise fat and remove waste from the body. It must be organic, though. CBD - better still cannabis oil which is one of the most potent medicines there is. CBD is legal but it comes from industrial hemp, so is it as effective as cannabis oil? I doubt it otherwise they wouldn't have made it legal to sell it. Of course, they have criminalised cannabis oil from marijuana. After all, they don't want you getting your hands on cheap, natural, effective cures thereby reducing the profits of the multi-billion dollar pharmaceutical industry. Don't forget that big pharma creates customers not cures. In humans and dogs, the gut protects the body from undesirables, but it is damage to our guts that is leading to the rapidly rising incidences of serious, diseases. Most of these diseases can be attributed to 'leaky gut syndrome'. When the gut is damaged, it allows these undesirables through into the blood stream where the bodies immune system launches an attack on them. The more nasties that get into the bloodstream, the greater the symptoms of the body. Look at the number of children that now suffer from allergies!! Our guts and our pets guts are being damaged by increasing exposure to nasties all around us - antibiotics, highly processed food, herbicides, pesticides, GMO foods, pollution and worst of all, vaccinations. Now one of the biggest threats to all of us is GLYPHOSATE - it's in the food chain and sprayed all around us. Over the last 2 decades, we have found 2 medications which appear to prevent progression or result in clinical remission of DM in many (up to 80%) of the patients. These medications are aminocaproic acid (EACA) and n-acetylcysteine (NAC). The GSD has more than its “fair share” of immune-related problems, and they appear in the intestines, eyes, skin, and other places. The breed has many individuals with a deficiency of a particular immunoglobulin called IgA, and this genetic defect may be very close on the chromosome to genes controlling general immune problems. Does Your Dog Have Leaky Gut? The Importance of a Balanced Gut - When this is thrown off balance by any of a number of factors (antibiotics, corticosteroids, highly processed diets like kibble, and vaccinations, to name a few), the bad bacteria and yeast take over. The imbalance then causes damaging inflammation, which in turn causes leaky gut. 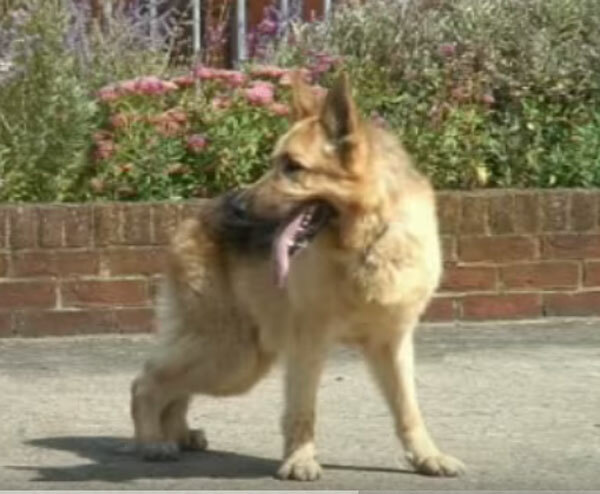 The occurrence of a progressive pelvic limb ataxia and paresis in the older German shepherd dog (GSD) had been recognised for many years. Originally the clinical signs were attributed to the presence of ossified plaques in the dura mater which commonly developed at the cervical and lumbar enlargements, usually on the ventral and ventrolateral aspects of the spinal cord.